Every Wednesday through the year (except over Christmas & New Year) there is a short lunchtime concert (lasting about 20/30 minutes) at All Saints Oakham. During term time these are presented by Oakham School, featuring their pupils and staff. Catmose College often present one or two concerts at the end of term, and during the holiday period concerts are arranged by the All Saints Concert Society on behalf of the Church. Admission is free, but there is a retiring collection in aid of Church funds. Enjoy the opportunity to hear the splendid Kenneth Tickell organ in All Saints Oakham on Bank Holiday Monday mornings. Recitals last about 50/60 minutes, and are followed by lunch in the church hall opposite the church. Admission is free (retiring collection in aid of Church funds), and lunch costs just £5. 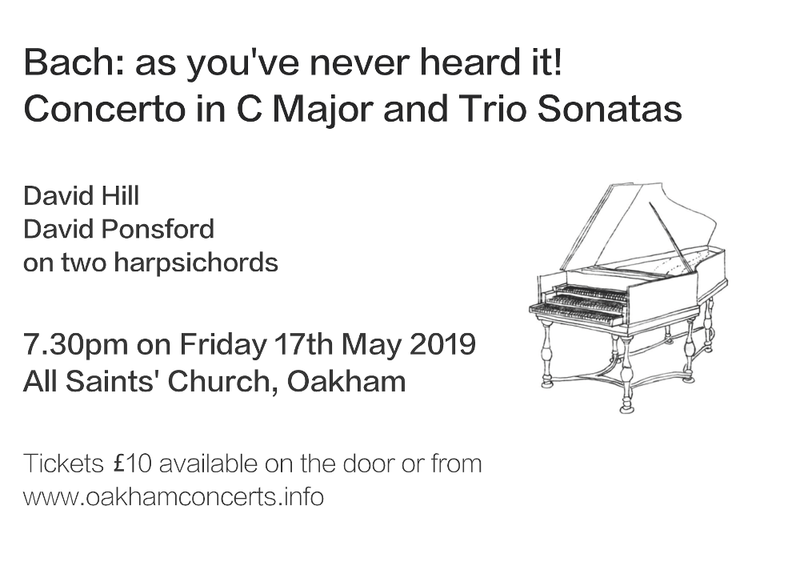 Occasional evening concerts take place at Oakham, and also at some of the village churches, particularly Langham – full details are listed below. David Hill, Musical Director of The Bach Choir & Music Director of Leeds Philharmonic Society Followed by lunch in the Church Hall (£5). Nigel Stark, St Martin & St Mary Stamford Followed by lunch in the Church Hall (£5). Thomas Keogh, Holy Cross Priory Leicester Followed by lunch in the Church Hall (£5).